The same logic mysteriously answers many vital questions, such as 1) the difference between rationality and rationalization, 2) that between virtue and virtue signaling, 3) the nature of honor and sacrifice, 4) Religion and signaling (why the pope is functionally atheist) 5) the justification for economic inequality that doesn’t arise from rent seeking, 6) why to never tell people your forecasts (only discuss publicly what you own in your portfolio) and, 7) even, how and from whom to buy your next car. My argument is that there is a more essential aspect: filtering and the facilitation of evolution. Skin in the game –as a filter –is the central pillar for the organic functioning of systems, whether humans or natural. Unless consequential decisions are taken by people who pay for the consequences, the world would vulnerable to total systemic collapse. And if you wonder why there is a current riot against a certain class of self-congratulatory “experts”, skin the game will provide a clear answer: the public has viscerally detected that some “educated” but cosmetic experts have no skin in the game and will never learn from their mistakes, whether individually or, more dangerously, collectively. Have you wondered why, on high-speed highways there are surprisingly few rogue drivers who could, with a simple manoeuver, kill scores of people? Well, they would also kill themselves and most dangerous drivers are already dead (or with suspended license). Driving is done under the skin in the game constraint, which acts as a filter. It’s a risk management tool by society, ingrained in the ecology of risk sharing in both human and biological systems. The captain who goes down with the ship will no longer have a ship. Bad pilots end up in the bottom of the Atlantic Ocean; risk-blind traders become taxi drivers or surfing instructors (if they traded their own money). Systems don’t learn because people learn individually –that’s the myth of modernity. Systems learn at the collective level by the mechanism of selection: by eliminating those elements that reduce the fitness of the whole, provided these have skin in the game. Food in New York improves from bankruptcy to bankruptcy, rather than the chefs individual learning curves –compare the food quality in mortal restaurants to that in an immortal governmental cafeteria. And in the absence of the filtering of skin in the game, the mechanisms of evolution fail: if someone else dies in your stead, the built up of asymmetric risks and misfitness will cause the system to eventually blow-up. Yet the social science and the bureaucrato-BSers have missed and keeps missing that skin in the game is an essential filter. Why? Because, outside of hard science, scholars who do not have skin in the game fail to get that while in academia there is no difference between academia and the real world, in the real world, there is. 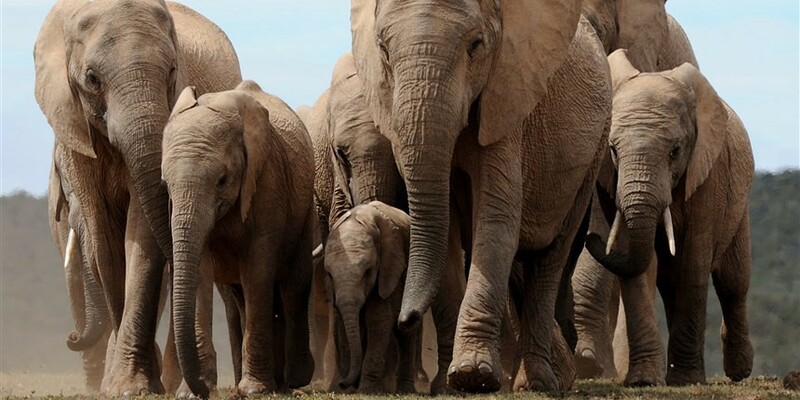 They teach evolution in the classrooms but, because they are not doers, they don’t believe that evolution applies to them; they almost unanimously vote in favor of a large state and advocate what I’ve called “Soviet-Harvard top-down intelligent design” in social life. As illustrated by the story of the surgeon, you can tell, from the outside, if a discipline has skills and expertise, from the presence of the pressures of skin in the game and some counterintuitive consequences. But what we call “empty suits”, of the kind you see in think tanks or large corporations –those who want to increasingly run our lives or intervene in Libya — look like actors playing the part, down to their vocabulary and the multiplicative meetings. Talk is cheap and people who talk and don’t do are easily detectable by the public because they are too good at talking. Plumbers, bakers, engineers, and piano tuners are judged by their clients, doctors by their patients (and malpractice insurers), and small town mayors by their constituents. The works of mathematicians, physicists, and hard scientists are judged according to rigorous and unambiguous principles. These are experts, plus or minus a margin of error. Such selection pressures from skin in the game apply to perhaps 99% of the population. But it is hard to tell if macroeconomists, behavioral economists, psychologists, political “scientists” and commentators, and think-tank policymakers are experts. Bureaucrato-academics tend to be judged by other bureaucrats and academics, not by the selection pressure of reality. This judgment by peers only, not survival, can lead to the pestilence of academic citation rings. The incentive is to be published on the right topic in the right journals, with well sounding arguments, under easily some contrived empiricism, in order to beat the metrics. Accountants (that is, bankruptcy or its absence), not other “peer” forecasters, nor referees using metrics should be judging forecasters. Alas, you can detect the degradation of the aesthetics of buildings when architects are judged by other architects. So the current rebellion against bureaucrats whether in DC or Brussels simply comes from the public detection of a simple principle: the more micro the more visible one’s skills. To use the language of complexity theory, expertise is scale dependent. And, ironically, the more complex the world becomes, the more the role of macro-deciders “empty suits” with disproportionate impact should be reduced: we should decentralize (so actions are taken locally and visibly), not centralize as we have been doing. In addition, owning one’s risk was an unescapable moral code for past four millennia, until very recent times. War mongers were required to be warriors. Fewer than a third of Roman emperors died in their bed (assuming those weren’t skillfully poisoned). Status came with increased exposure to risk: Alexander, Hannibal, Scipio, and Napoleon were not only first in battle, but derived their authority from a disproportionate exhibition of courage in previous campaigns. Courage is the only virtue that can’t be faked (or gamed like metrics). Lords and knights were individuals who traded their courage for status, as their social contract was an obligation to protect those who granted them their status. This primacy of the risk-taker, whether warrior (or, critically, merchant), prevailed almost all the time in almost every human civilization; exceptions, such as Pharaonic Egypt or Ming China, in which the bureaucrat-scholar moved to the top of the pecking order were followed by collapse. 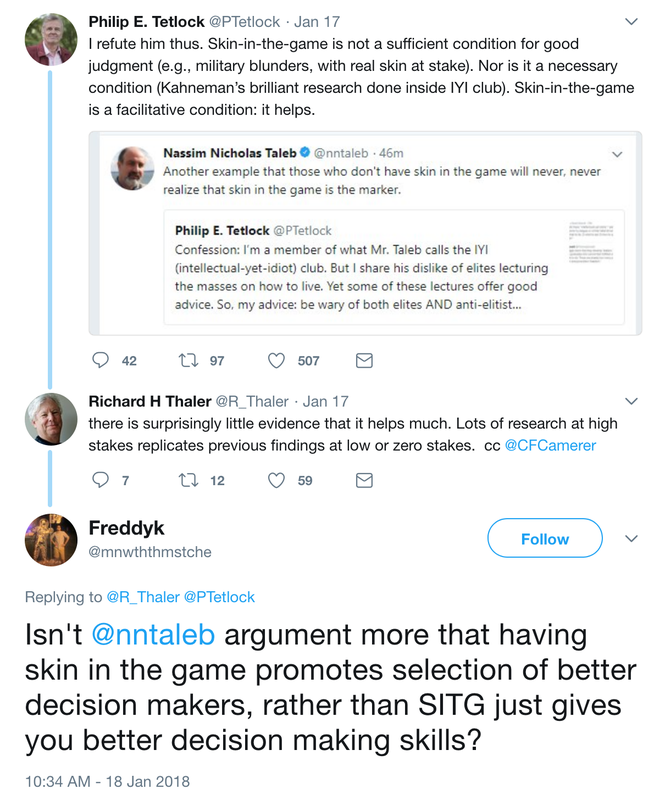 Tetlock and Nudgeboy Thaler didn’t get the idea of skin in the game. It’s not an aid for decision-making. Even if it is so, it is not incentive. He seems to not realize that there is such a thing as evolution.